Studio 54 – Film Review by Frank L.
Steve Rubell and Ian Schrager met in college in the late sixties and by somewaht circuitous routes teamed up in the mid-nineteen seventies to open discos. The first one was in Queens but the one which made them famous was the eponymous Studo 54 which opened on 26th April 1976. They both had enormous chutzpah and they converted the premises at 254 West 54th Street from a redundant music studio and former theatre in a mere six weeks into the most famous night club in Manhattan. They retained many features of the original building and the sound and lighting equipment which had been left behind by the previous occupants. The result was a space which every hip New Yorker wanted to enter. But in order to obtain entry there was a highly subjective and idiosyncratic door policy. The doorman and Steve Rubell determined who could enter and they had to like the cut of your garb. If they did not you could not get in. This was not a location for the staid or for the bridge-and-tunnel weekenders. What took place inside was the celebration of freedom in very many ways. Law, order and conventions were miles away. The film charts the opening of the night club and its stellar international fame and success and its Icarus like collapse following the convictions of Rubell and Schrager at the hands of the IRS in 1979. 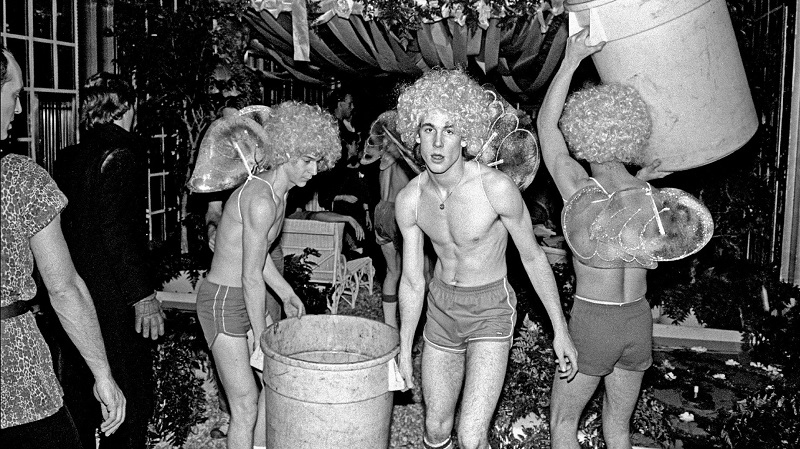 Bird-like its trajectory was brief but in its short existence it encompassed the very Zeitgeist of New York in a hedonistic period which raged in the city that never sleeps before AIDS was to ravage it in the eighties. Rubell was to be a victim of that scourge. Schrager was to survive and thrive to create one of the most successful boutique hotel chains in the world. There is contemporary footage from inside and outside the club and snippets of interviews with the ebullient Rubell and the more contemplative Schrager. There are also interviews with employees and customers from those heady days. It is all melded into a film which is both glamorous and rebellious. There is a feeling throughout that this ebullient meteor of a night club was too iconoclastic to last. While its existence was fleeting, its fame has lasted. Tyrnauer gets, as near as possible, to re-imagining the world that permitted Studio 54 to shine so brightly and briefly in the firmament. It is rekindles a very brief moment of decadent magic.